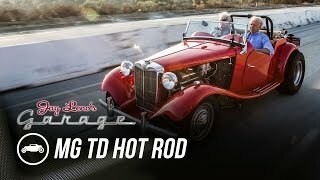 Jay Leno and his ’52 MG TD HotRod… This MG is all HotRod. I love the classic Fendered Roadster look, and american sound. I’m a small car guy, and I have HotRodded British cars before… They really are small. Jay Leno gets a little bitchy about the legroom as he hangs out with the builder. Hi! Come on in… Let me get you a beer ! Hey, crank up the volume.